School Bus Tracker monitors the location of school buses as they travel their routes across the city. By connecting to the Parent Portal, you can see how close the bus is to the bus stop. ​The Parent Portal is available for all students assigned a bus stop. 1. Have your child’s Student ID # ready. Your child uses this number to log on to school computers. If your child doesn’t have it memorized, you can visit the school. NOTE: Using your child’s Student ID means you will be the only one seeing your child’s bus, and no one else will see your child’s assigned bus or bus stop. NOTE: School Bus Tracker will not work if your browser’s privacy setting is turned on. Private Browsing in Safari, Incognito Browsing in Chrome, or similar private internet browsing modes cause Bus Tracker to be unable to access the database information that includes your child and his/her bus stop. In order to display students, your web browser must not be in Private Mode or Incognito Mode. Don’t have the Student ID # … You can also request your student’s Student ID # by visiting the school. If you’re egistered to follow your child’s grades on Home Access Center, you can find that ID # there. Many students have their Student ID # memorized. Can’t Register Student for Bus Tracker …Only students who are eligible for SPS bus transportation will be found in the Bus Tracker system. 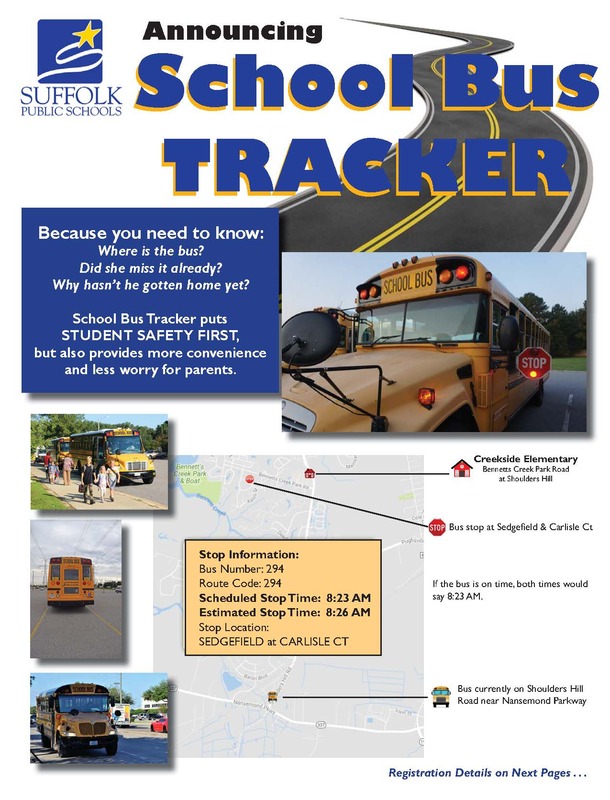 If your student is assigned to a bus but the Bus Tracker can’t find them in the system, please contact the Transportation Department at (757) 925-5573. Student Doesn’t Appear under Registered Students when I use my SmartPhone … In order to display students, your web browser must not be in Private Mode or Incognito Mode. See the links under the NOTE above to learn how to turn off Privacy mode. First Stop on the Route … If your bus stop is the first stop on the bus route, you may find that the tracker will be less accurate. Actual Stop Time Still Says Pending … The system will update the Actual Stop Time if the bus driver stops and opens the door. If the door is not opened at a particular stop, the Actual Start Time will say “Pending” even after the bus passes by. In this instance, the refresh button can help track the location of the bus. Timeout (“Request failed”) … If the “Request failed message” is displayed, please logout and re-login to reconnect. Viewing Timeframe (“Run is not within the time window”) … Your child’s bus can only be tracked during a set time window that is based on the first and last bus stops on the bus route. If you attempt to track a bus too early or too late in the day, you will see this message.